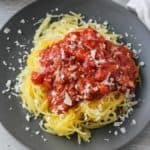 March 17, 2019 By Liz 13 Comments Note: This post may contain affiliate links. 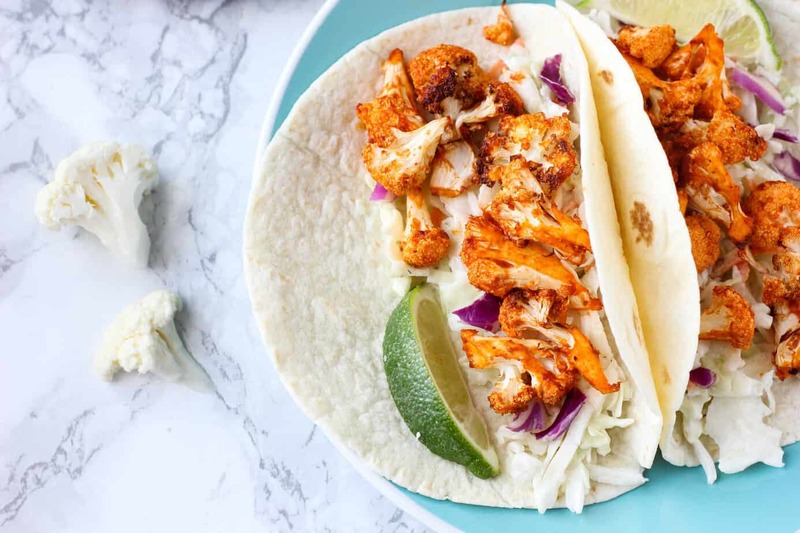 These spicy buffalo cauliflower tacos are perfect for an easy weeknight dinner! You can make them in the oven or air fryer. 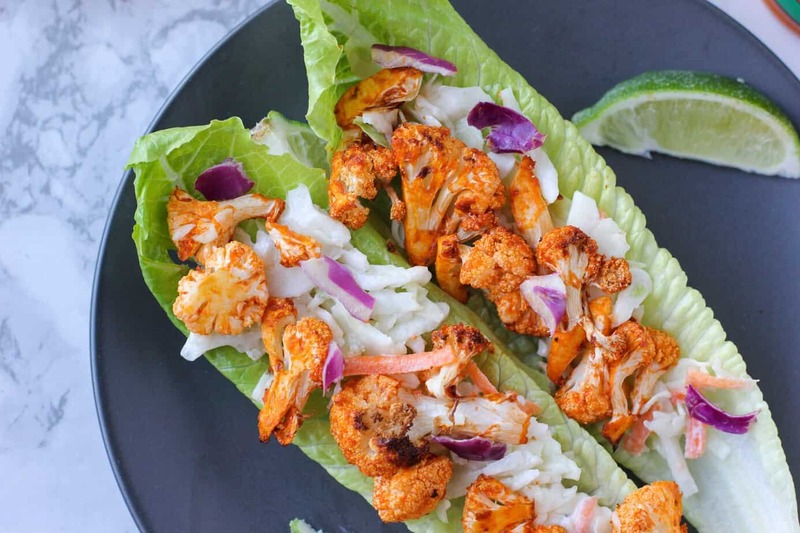 For a low carb option, serve the buffalo cauliflower in romaine lettuce leaves! 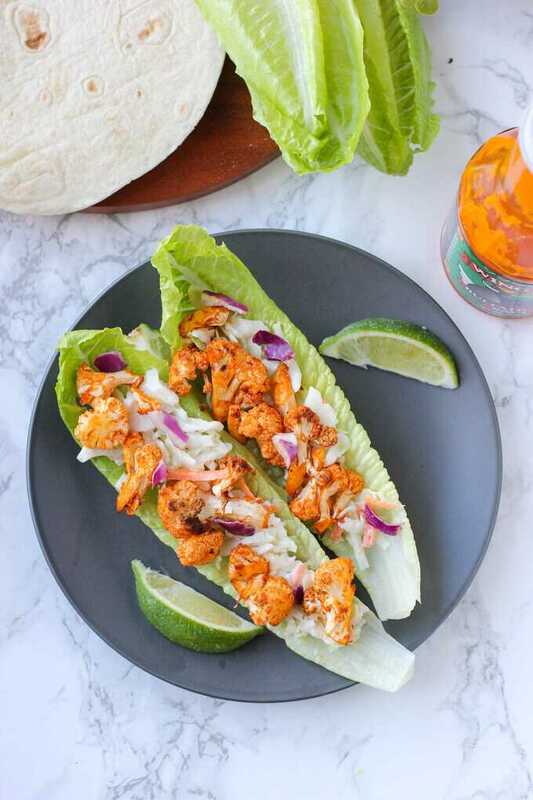 I shared a version of these buffalo cauliflower tacos in my cookbook but I just couldn’t resist sharing another version here on the blog. Alex and I both love these tacos because they’re spicy and filling but they’re so easy to make. It literally takes just 30 minutes from start to finish, including clean up time. All you have to do is chop the cauliflower, toss it with sauce, roast it, and then fill your taco shells! I’m going to share an oven method and an air fryer method. The air fryer method is my favorite but don’t stress if you don’t have one. You can still make delicious tacos in the oven. 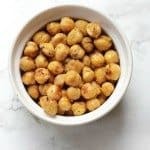 While the air fryer is a totally optional appliance, I’ve had a lot of fun using it for everything from chipotle sweet potato fries to roasted chickpeas. And now, I’m adding buffalo cauliflower to the list. An air fryer is basically a convection style oven. It circulates hot air around a metal basket which creates a crispy outer layer. Not to get all scientific here but there is something called the Maillard reaction, which is the chemical reaction that gives food a browned or crispy crust. An air fryer basically makes that reaction happen. What this means for you is that you can get browned, crispy crusts without having to truly “fry” anything. An air fryer can mimic the texture with just a tiny bit of oil. 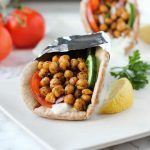 But even if you just make these in the oven, you’ll still get that all of that deliciously spicy flavor wrapped in a taco shell (or lettuce leaf!) and these will become a favorite in no time. For the buffalo sauce, we typically use Frank’s Red Hot but admittedly, it’s not the “cleanest” list of ingredients. For cleaner options, Tessamae’s and The New Primal both make buffalo sauce that is sugar free, dairy free, etc. So if you have dietary restrictions, be sure to check out those sauces! 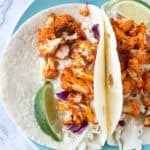 These spicy buffalo cauliflower tacos are delicious in the oven or air fryer! For a low carb option, try these served in romaine lettuce leaves! In a large bowl, combine the hot sauce, olive oil, and paprika. Spread the cauliflower into a single layer on baking sheet coated with non-stick spray. Add the cauliflower and cabbage into the tortillas and drizzle with ranch dressing. Place in the air fryer for 10 minutes, then gently stir the cauliflower in the air fryer basket. Continue to cook for 5-10 minutes until browned. Note: For a low carb option add the cauliflower into large romaine lettuce leaves to make lettuce wraps. If your air fryer is small, you may need to do this in two batches. I like to toss the cabbage into a bit of ranch dressing before topping it with cauliflower. My absolute favorite brand is Brianna’s Ranch Dressing. You only need a little bit but it adds such a nice balance of flavor with the spicy buffalo sauce! If you want to make your own, you could make this avocado ranch dressing instead, which is a bit healthier! Can’t get enough buffalo? 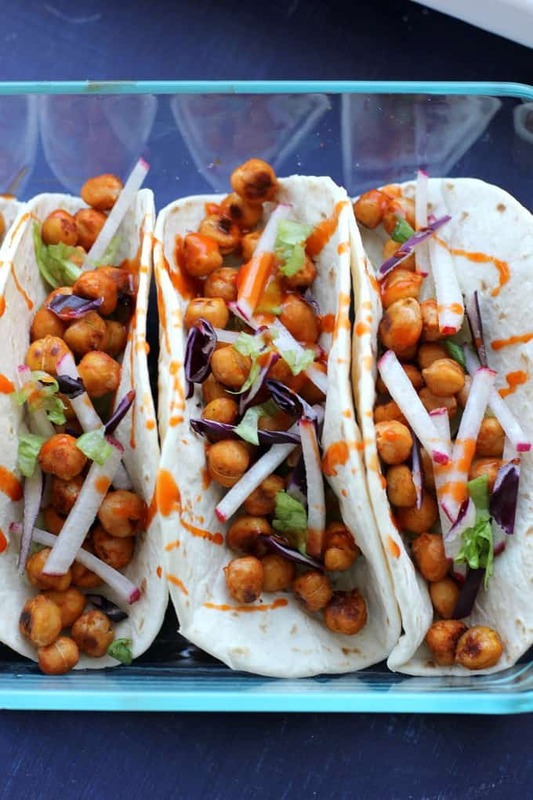 Try these buffalo chickpea tacos next! What’s your favorite type of taco? These look so yummy and healthy! Love the low carb option as well! 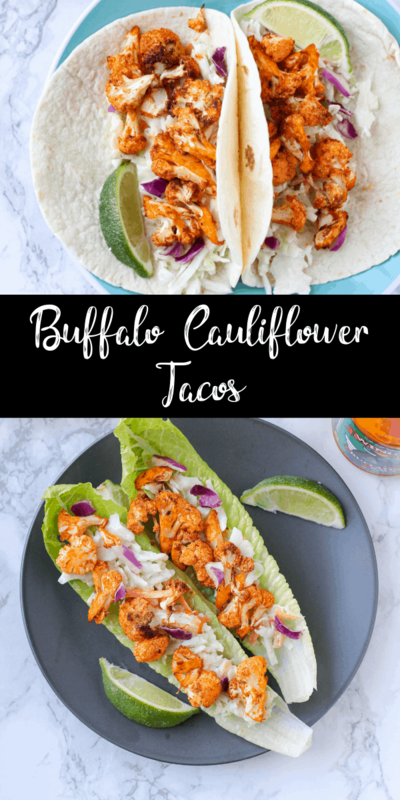 I love cauliflower tacos and the addition of the buffalo sauce here makes them sound even more delicious! I’ve been enjoying buffalo cauliflower myself lately. I need to make these soon. this is such a great idea! love the idea of using cauliflower in tacos. so much fun! i totally wish i had an air fryer so i could try that. I keep hearing such great things about the air fryers. Until I get my hands on one, I’ll definitely be using the oven method. These look amazing! These sound absolutely delicious! What a great idea to use cauliflower!! Great Vegetarian option. Love the Sauce flavor and the recipe too.Tacos looks delicious. I am a sucker for all things buffalo and these did NOT disappoint! So much flavor! We love anything with buffalo sauce so I’m excited to try your buffalo cauliflower tacos. They look light and delicious. Wow! 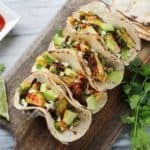 This is such a flavorful taco! I have been learning how to use my air fryer and can’t wait to try these yummy tacos in it! 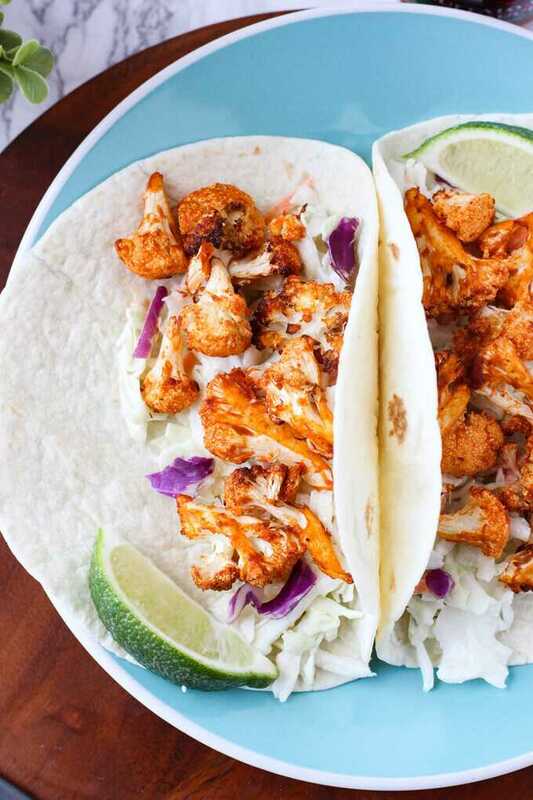 I love spicy food and these spicy cauliflower tacos looks scumptious! These look great, I will make these for a good change on our next taco tuesday!